the computational operations in the program are arranged so that an echo is produced, and not some other effect. But these operations could be arranged differently, so as to produce quite different effects, in a different but related program. So there are two kinds of flexibility in programs that we have not captured: the ability to use the same program to represent different sounds, and the ability to recombine the same computational operations so as to represent different operations in a target domain. 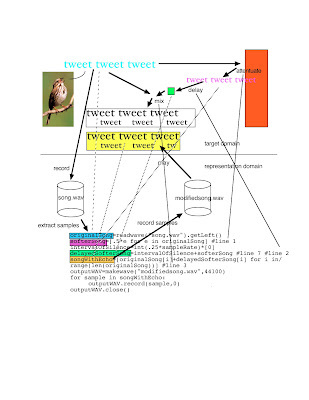 These capabilities are crucial in reducing the cost of creating computational representations. How can we understand them within the representational framework? With the general relationships among collections of things laid out, the second aspect of the representation system we need to attend to is how we can deploy the operations in it so as to secure some particular desired result. After all, Figure 2 just tells us that there is a way to add the echo, it doesn't actually add it to anything. 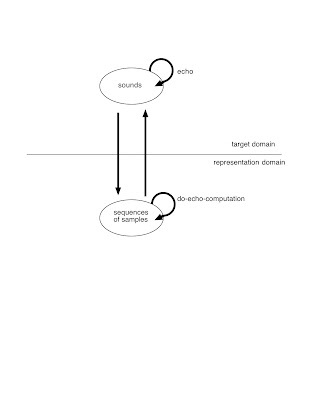 To get this to happen we have to have a way to pick out a particular sound, and then cause the operation shown in Figure 2 to be carried out as appropriate for that sound. Let's call this part of of our work application: we want to apply the operations in the representational system to a particular input. In practice, this important matter is handled rather haphazardly in programming systems. In one scenario, application starts with a physical recording process, and what sound I am applying that process to is determined by when and where I do it: it applies to whatever sound is happening at that time and place. The recording process produces a computational entity called a file, which is given a name and stored in a certain way in a computer. Applying computational operations to that file, and not some other, usually depends on using the name in an appropriate way, and also carrying out the computational operations in a particular context, one that associates our particular file with the operations, and not some other file with the same name stored in a different way. Even though getting the intended results from our computational operations depends crucially on these operations (recording, naming, and storing) being carried out in the right way, programming systems don't specify how they should be done, nor provide any check that they have been done correctly. For example, if we use the wrong file name when setting up our computational operations there will no indication whatever that we have done that, provided only that the name we use picks out some file of the appropriate in our context. These defects aside, we see that we can account for some of the flexibility of computational representational systems. These systems can be applied to different particular things in their target domains. We don't have to build a new system when we want to add an echo to a new sound. This works because we can separate the construction of the system from its application.